The Spread of Religion - goyur group, inc.
​ The mysteries or religion spread like a virus throughout the world giving men the hope of everlasting life and other ways to bypass the will of The Most High, usually through sun worship, but also often including the idolatry of serpents and/or ravens. After the tower of Babel incident humanity spoke many different languages and settled into their own regions to rule as they saw fit, so the various civilizations that formed all told the same story of creation and the events leading to civilization from their perspectives. The building of large ziggurats and pyramids became a staple of nearly every early civilization as well as sun worship and stories of a large deluge (flood) which only a few survived and often included animals. The separation of humanity after the tower did not erase the understandings of humanity’s origins, it merely distorted it as would a message passed between too many people. ​All of the early civilizations told stories of a deluge and men surviving with their families in an ark or boat of some kind. The actual demise of Nimrod and Semiramis is a topic of contention amongst scholars and historians alike, with many oral traditions woven in as well. Titus Flavius Josephus, the famous historian and scholar who was half Yahudim and was born in 37 CE (4 years after the death of the Messiah) claimed that Nimrod, was beheaded by Shem, the son of Noahk, this is supported in midrash and in addition it is alleged that Shem then cut Nimrod's body into pieces and sent the pieces to the pagan temples erected in his kingdom, to discourage his priests and followers that their immoral sexual behavior, child sacrifices, and pagan deity worship would ensure that they would meet a similar judgment. This did not have the desired effect and caused the priests to act in secret instead. A Palestinian historian Kitto noted that this ended the days where "their altars smoke with human blood," (The Bible history of the Holy Land 1850). These priests used the pieces of Nimrod as relics to their clandestine gatherings which took place in hidden groves and/or secret shrines which became the first secret mystery cults. Due to Shem’s intervention, they were unable to practice orgies in public and for fear of Shem, they performed their immoral practices hidden and usually at night. These hidden gatherings were initiated with secret rites and symbols that only a select few inside the cult knew and they were sworn by oath to never disclose the secrets to the masses. This was the origin of all secret societies, the Illuminated Ones, those who knew the true purpose of their organizations and is one of the key reasons that many consider Nimrod to be the founder of Freemasonry, because the builders who were not destroyed at the tower established a new identity after his death in order to carry out his will, but now in secret. The priests of the mysteries praised Nimrod and Semiramis as Marduk and Astarte, they functioned as the centerpiece in a complex worship system where the deity’s true names and identities were held from the masses. The very few people at the top of this pyramid-power structure knew the truth, so they controlled the relationships with people and their worship and charged money for this service. Various pseudonyms were applied to them over the ages and often reflected an aspect or personification of the gods. 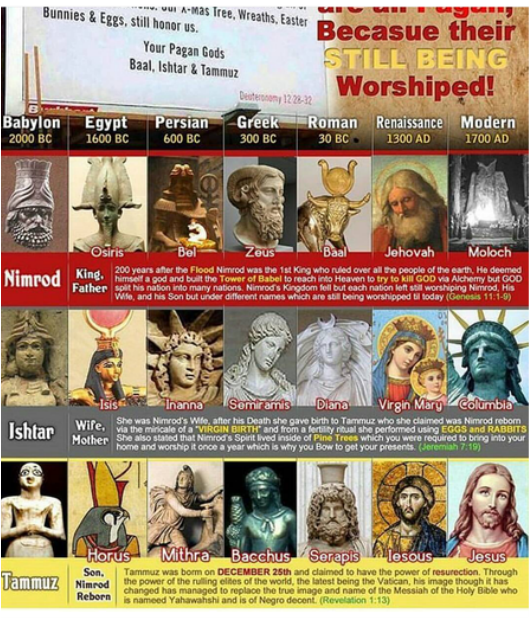 BEL/BAAL meaning Lord, became the name(s) foremost instituted to the masses during the time of Ancient Sumer, which is estimated at least 6000 years ago. The land of Mistrayim (Egypt) had variations of this spread to their land as well as every other major early civilization such as the Kena'anites (Canaanites), Pheonicians, Assyrians, and much later the Greeks. Everyone is telling the same twisted story in many different languages, but they all mean the same thing; BAAL-zebub (lord of the flies) is still today understood to be just another name for Satan or the messenger of Elohim that rebelled against the creator and caused others to rebel.